This models represents a cam and rod mechanism. If the input shaft is rotating with a constant speed, the output motion is a pure sinusoidal. The transmission ratio (i) is the ratio of the velocities of both ports (in fact a sinusoidal function of the shaft angle). 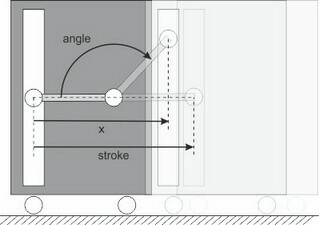 Stroke of the translation port (is equal to half the length of the rod).